Let’s get one thing straight right off the bat. 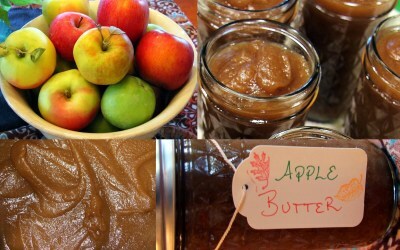 Apple butter contains zero actual butter. It’s a common misconception. 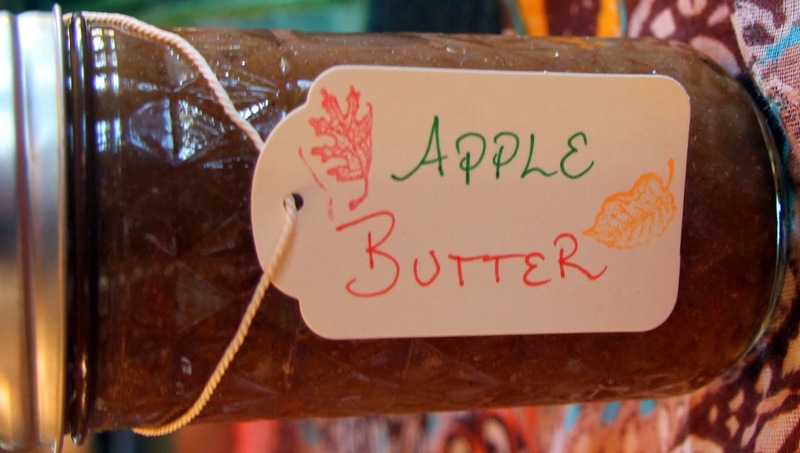 So common, in fact, that I can’t think of a single instance where, when apple butter is mentioned, I’ve not had to explain it’s absence of dairy butter. (Maybe it’s just the people I hang out with.) It’s named so for its texture; thick, smooth, decadent, like butter. It’s delicious on toast, biscuits, pancakes, as well as stirred into yogurt which is how I had it this morning. 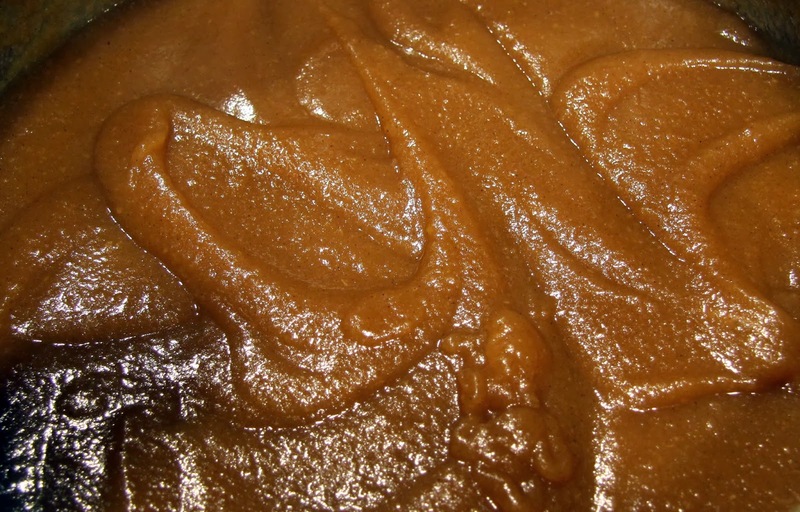 My first memories of apple butter, like most of my fondest food memories, come from sitting in my Grandma McCallum’s kitchen and spreading it on her legendary dinner rolls. I wish I had her recipe but this comes very close to what I remember. 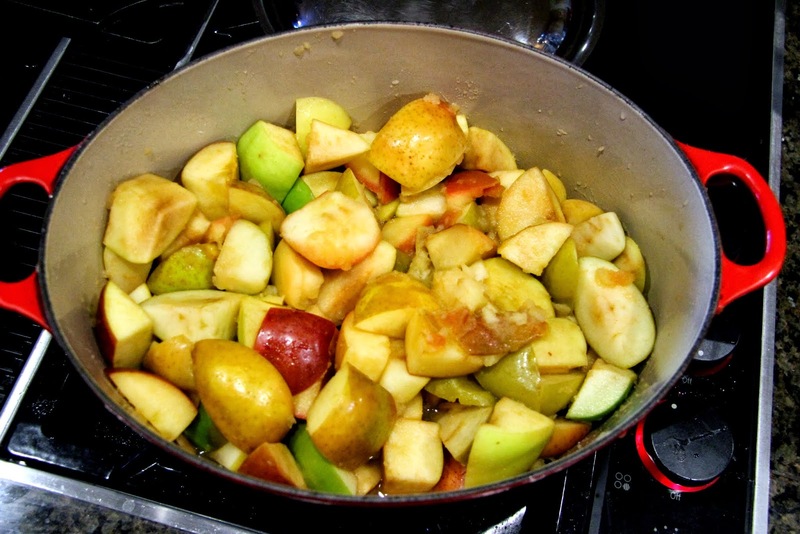 If you look at several recipes, as I did, you’ll find they are all quite similar… apples, cinnamon, allspice or cloves, and slow cooking. 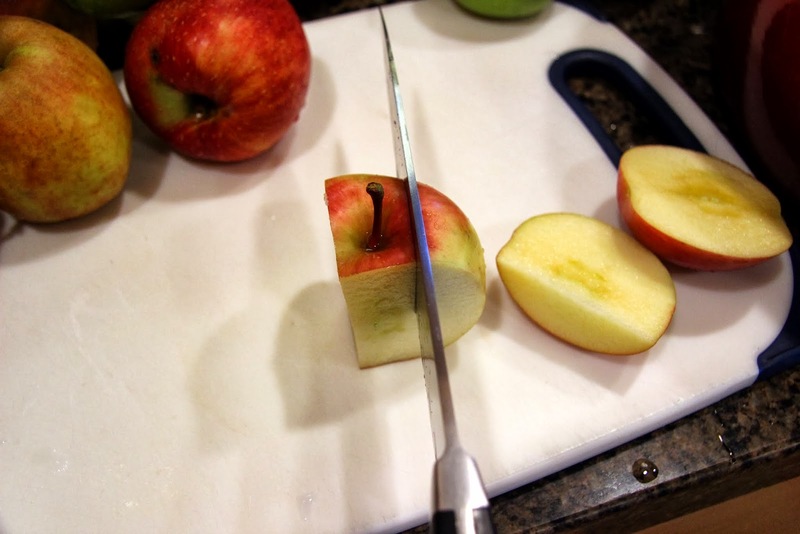 I like to have at least two varieties of apples, one sweet, one tart, for a more complex flavor. We enjoyed a fun day of apple picking in Hood River last weekend so I had lots to choose from and ended up using four varieties, super sweet Fujis, tart Granny Smiths, flavorful Spitzenburgs, and Winter Banana apples which were perfect for apple butter because they became kind of mealy and weren’t that great to eat on their own. 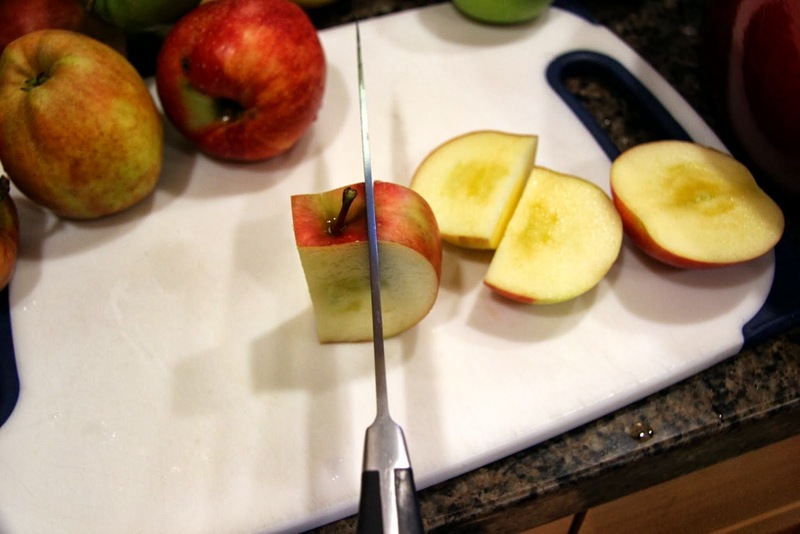 If you don’t have access to apple orchards, you will be perfectly fine with Fujis, Honey Crisp, Galas or the like for your sweet at the grocery store and you can always count on darling green Granny Smiths for your tart. food mill – Price ranges from $25 -$50. Also great for making fluffy mashed potatoes, baby food and removing seeds from fruit. immersion blender – Price ranges from $20 – $400 (seriously), $40 should get you what you need. 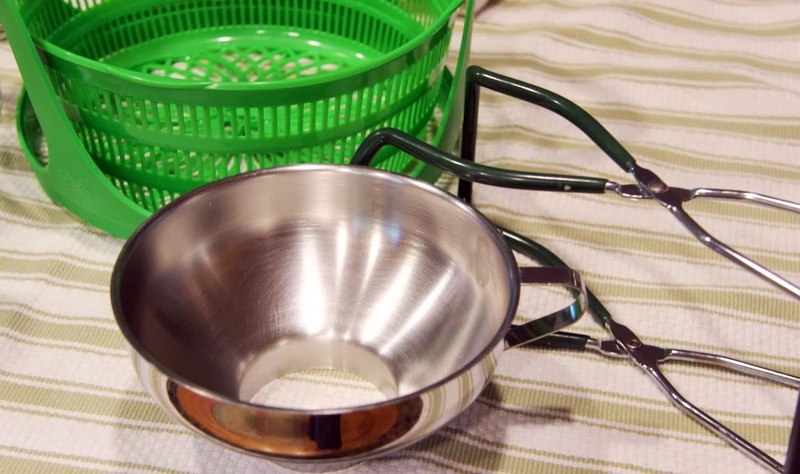 Really handy for blending soups and sauces on the stove. splatter screen – Price ranges from $10 – $15. 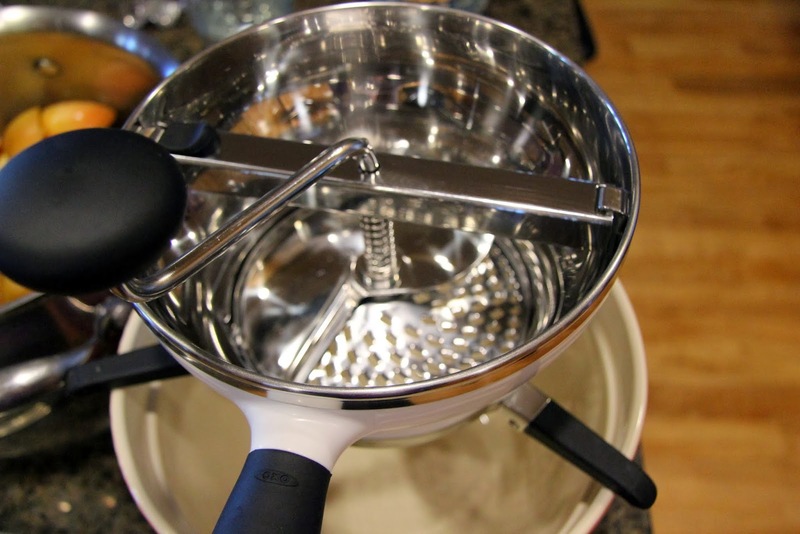 If you ever cook bacon or fry chicken on the stove, you should have one of these. Use both for safety and easier clean-up. 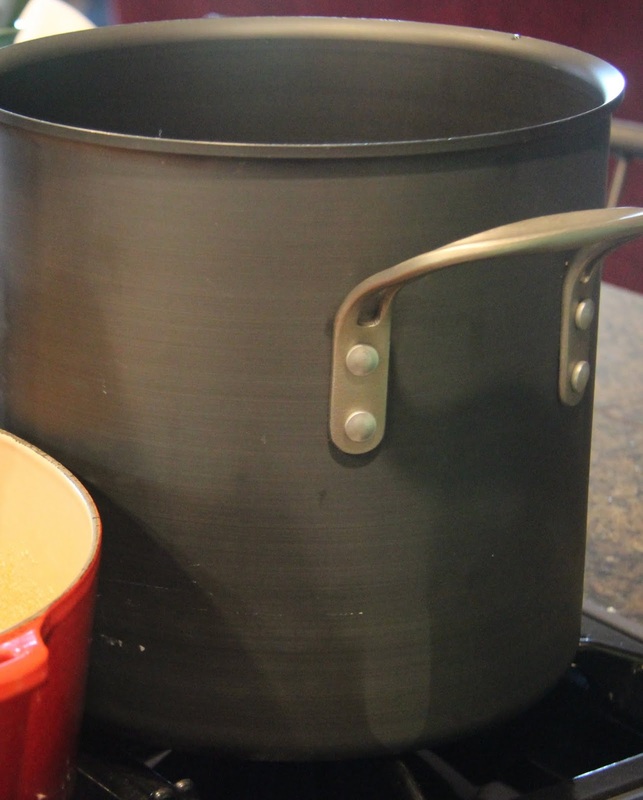 20 qt stock pot or canning pot – Prices range from $20 for a basic canning pot to $80 or more for a heavier duty pot for making stocks and soups. large mouth funnel – $8 -$10, good to have on hand for all your jar filling needs. Okay! 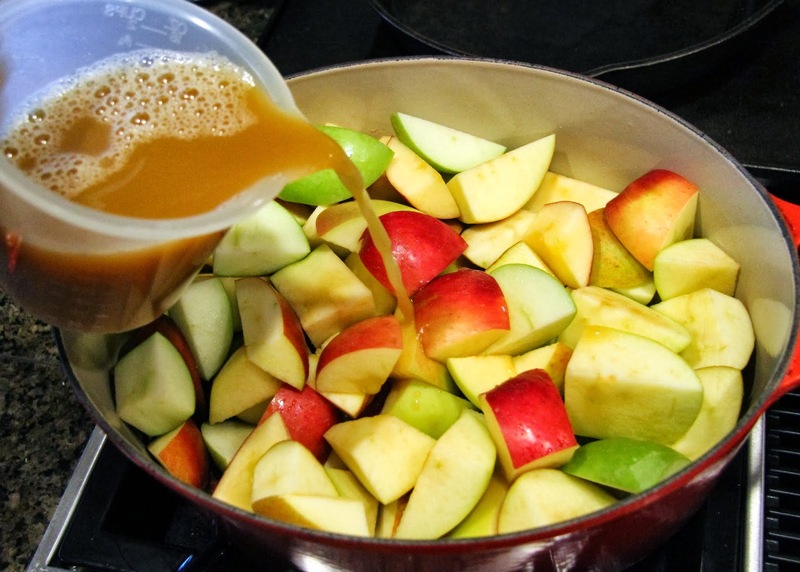 Now that I’ve, perhaps, completely overwhelmed you with information, let’s make some apple butter! 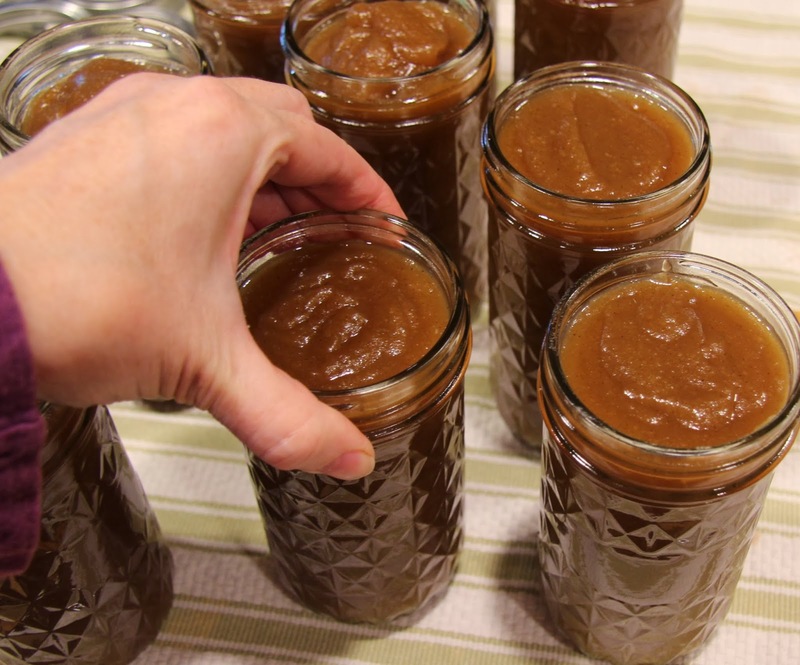 Did I mention you’ll also need quite a lot of time (mostly inactive), so read through the recipe before you begin… I promise it’s worth it if you’re up for the challenge and homemade apple butter makes a great gift for the holidays. 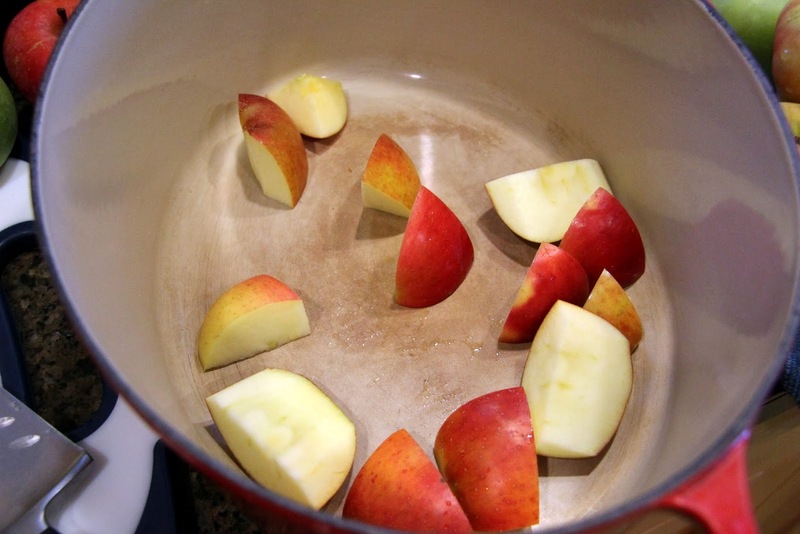 Place apples in a dutch oven or large saucepan with a solid, heavy bottom to prevent scorching. 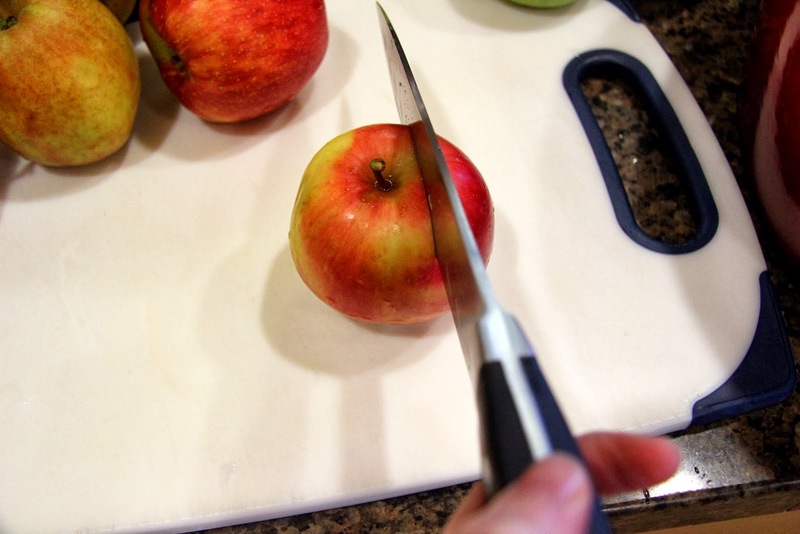 Pour in cider or juice. 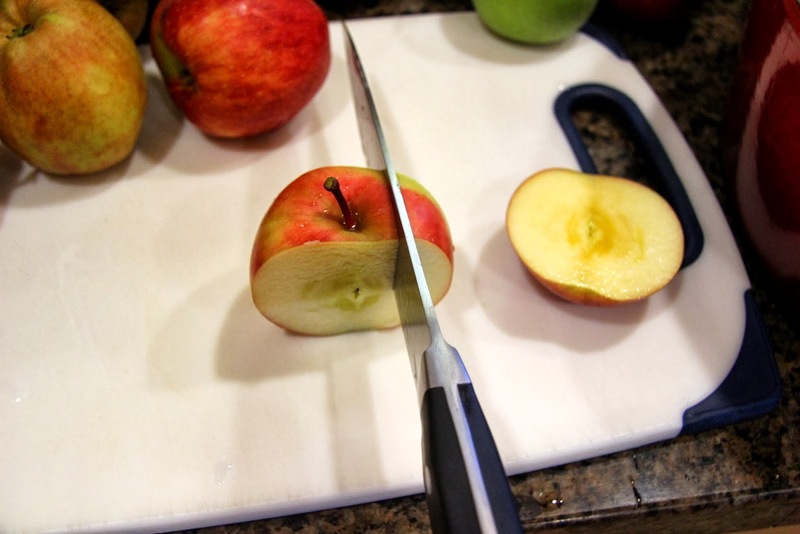 Cover and cook on low heat until apples are soft (a fork should pierce them easily), 30 – 45 minutes. Fit the food mill with the coarse screen. Place it over a large mixing bowl. 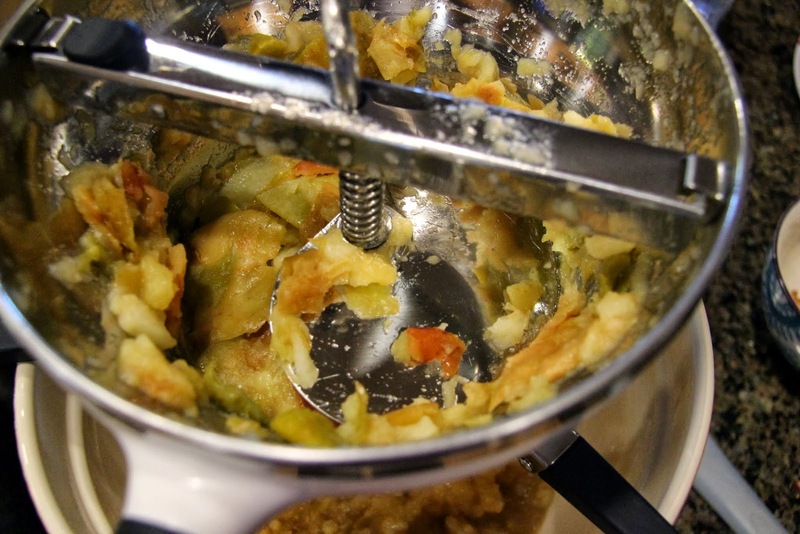 Fill it with cooked apples (about 1/3 of the apples at a time) and puree until only the skins are left in the bottom of the food mill. Make sure you scrape the bottom of the screen occasionally. 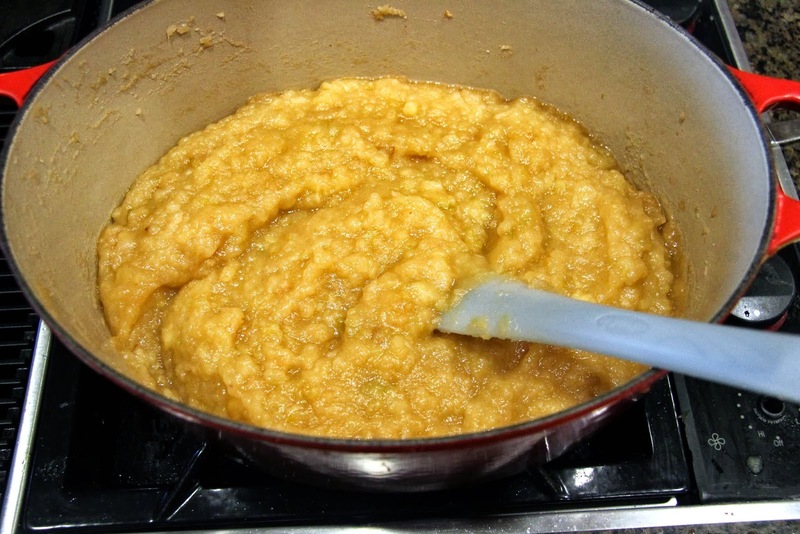 You should end up with approximately 8 cups of apple puree. 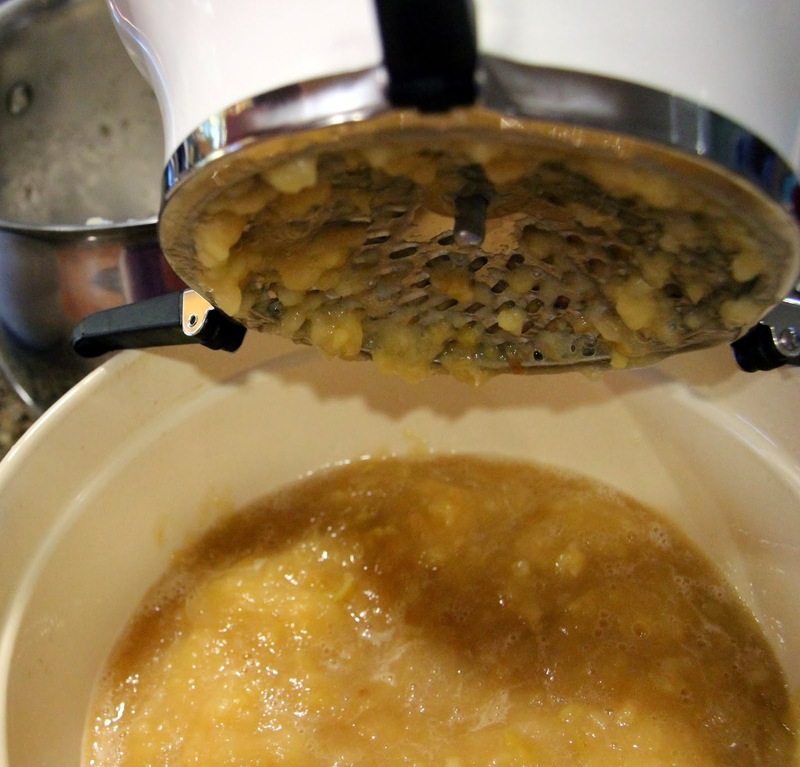 Transfer apple puree back to the pan. 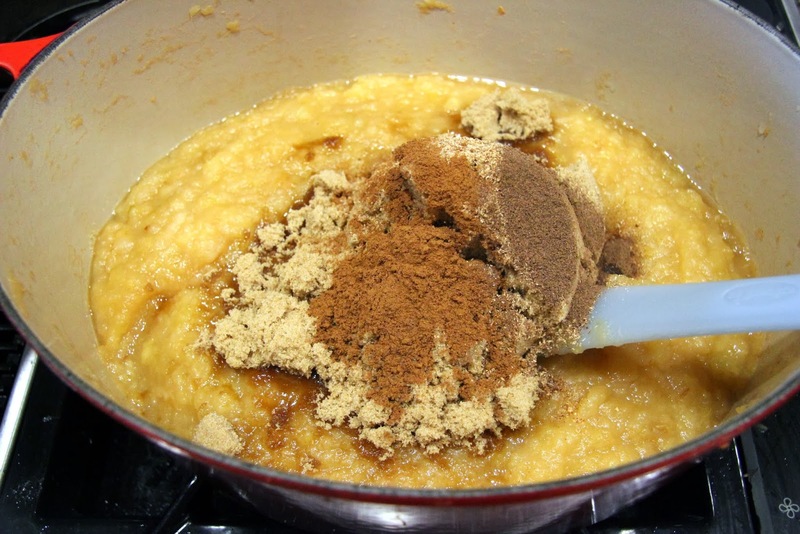 Stir in lemon juice, brown sugar, cinnamon, nutmeg, and allspice. 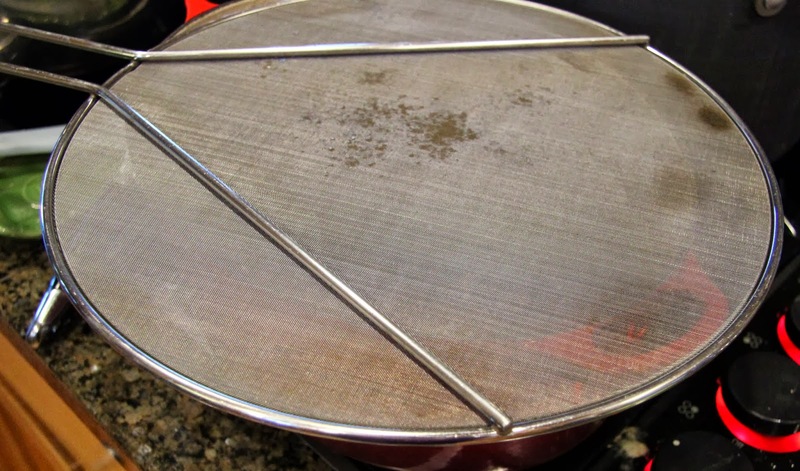 On medium heat, bring it to a simmer, then cover with a splatter screen or leave it uncovered (don’t use the pot cover, it needs the air). Turn heat to low and cook, stirring occasionally, until it begins to thicken, about 1 hour. 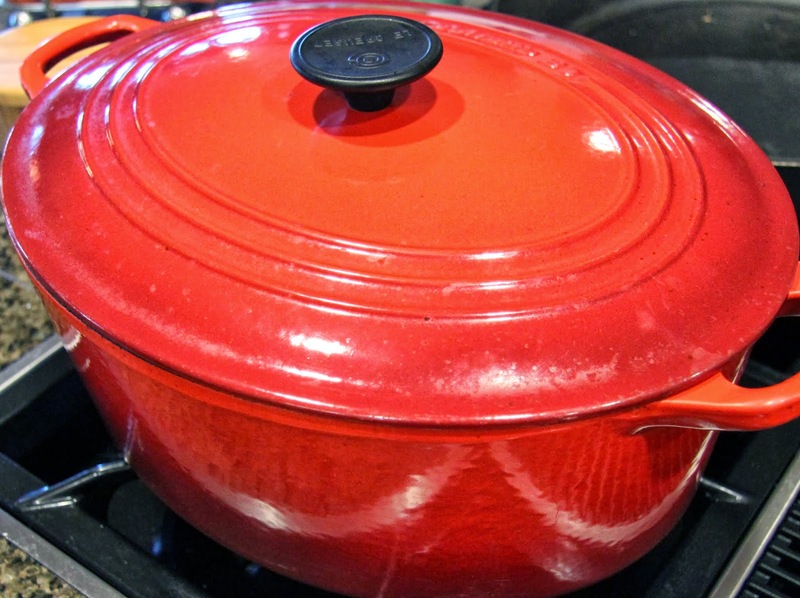 Keeping in mind it will take a long time to heat up, fill a large stockpot with water for processing the jars and place on high heat until it boils. 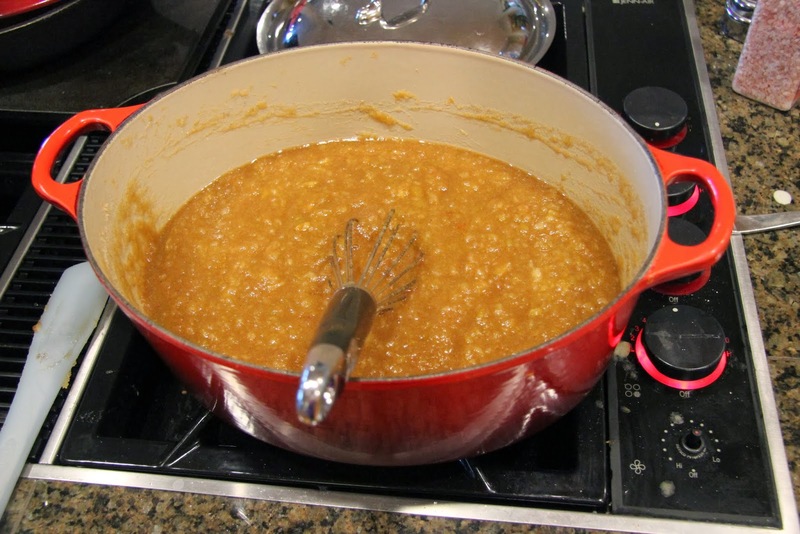 You will need to boil the clean, empty jars and lids for at least 10 minutes (for altitudes above 1000 ft, add 1 minute for each additional 1000 ft) to sterilize them before filling them with the apple butter. 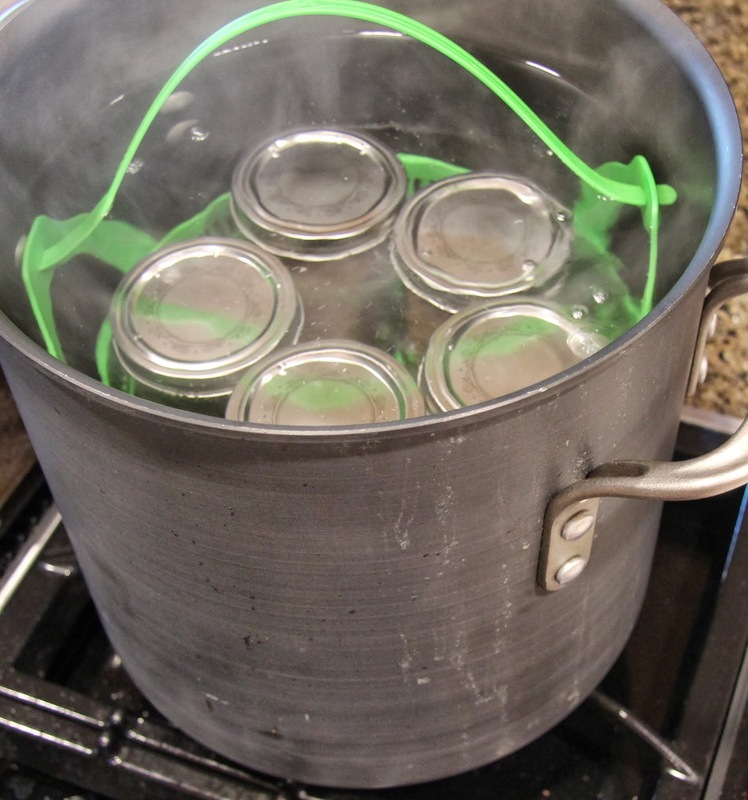 Using the jar basket, place the empty jars and lids in the boiling water, making sure there is at least an inch of water above the jars. 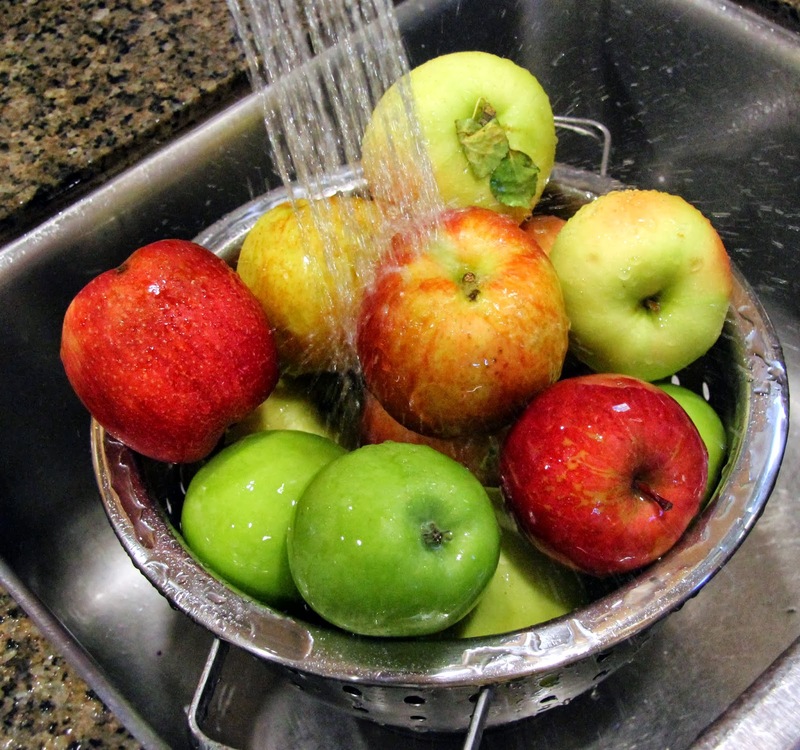 Remove them carefully by lifting the basket out of the water and using the jar tongs to set them on a clean, dry towel. 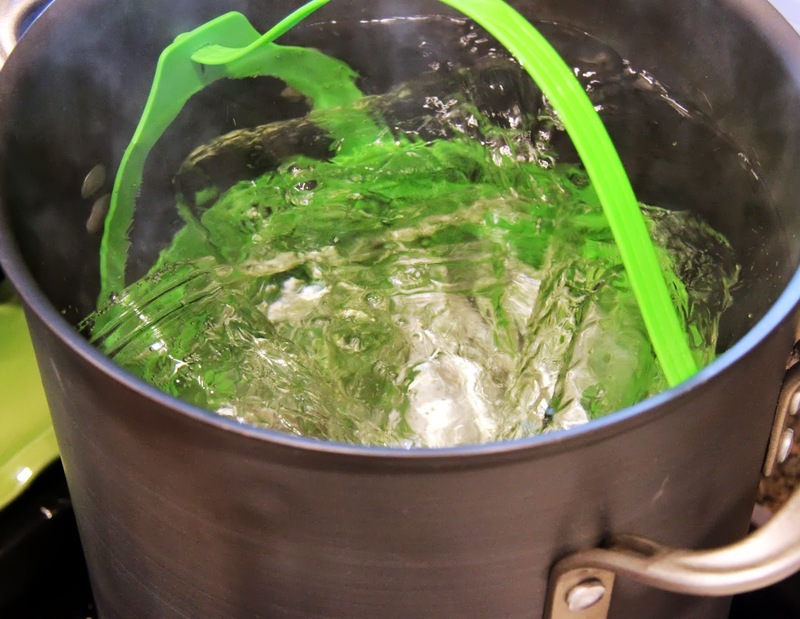 Keep the water warm so it’s easy to bring to a boil again after the jars are filled, adding more water as necessary. 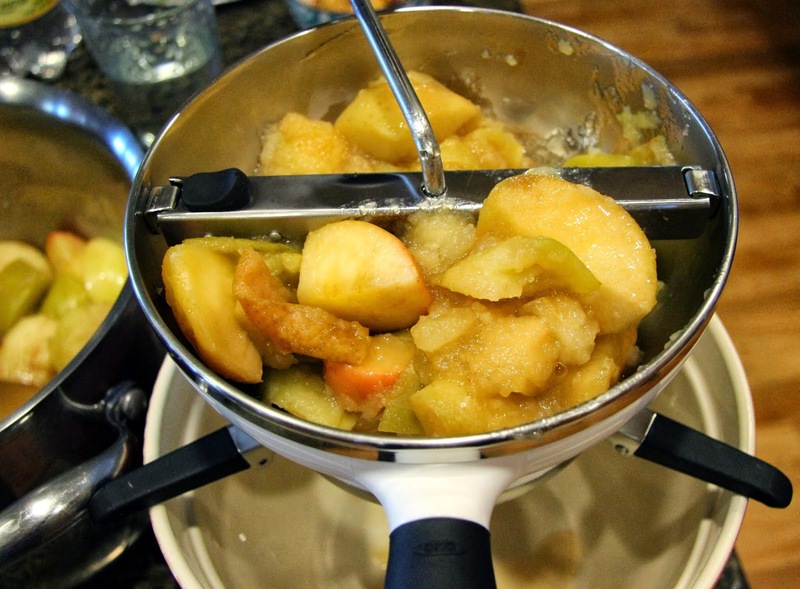 After the apple mixture has thickened, using the immersion blender, blend until smooth. 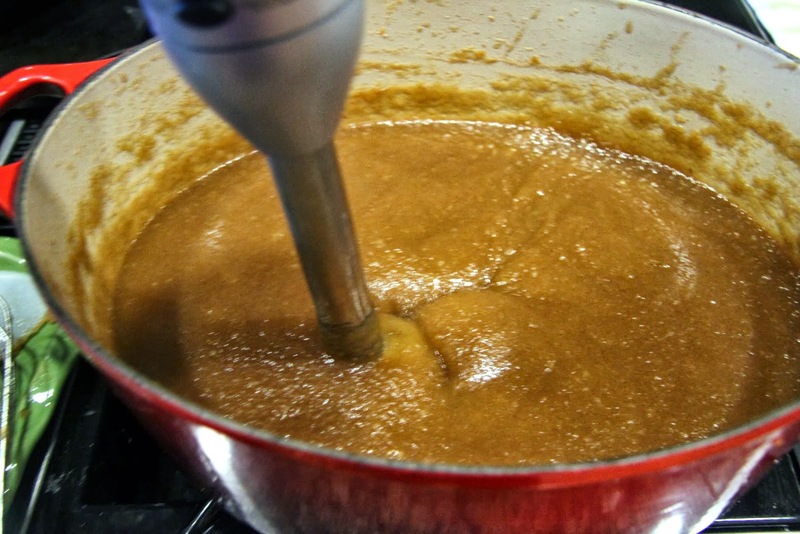 Cook on low heat, stirring occasionally, for about another hour, until it becomes quite thick and similar to caramel in color, as pictured below. 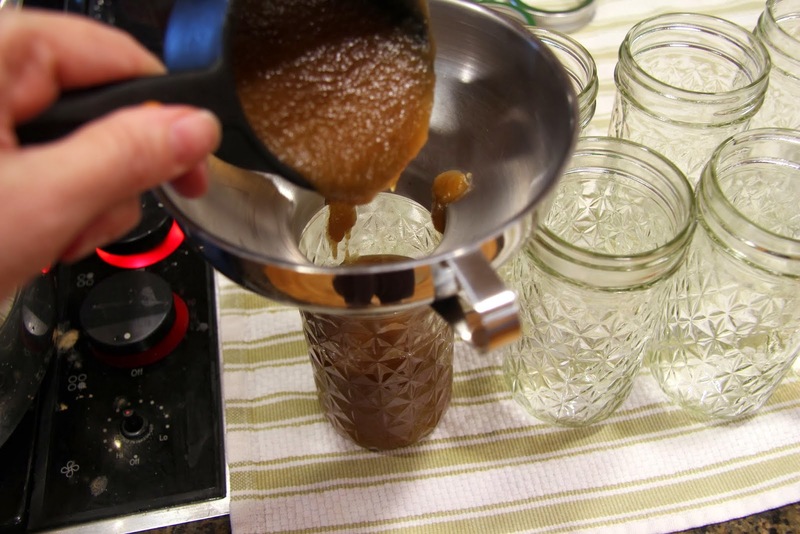 Fill prepared jars, leaving at least 1/4 inch of headspace above the apple butter to the top of the jar. This will allow the lids to seal correctly. Tap the jar down on the towel a few times to even out the top. 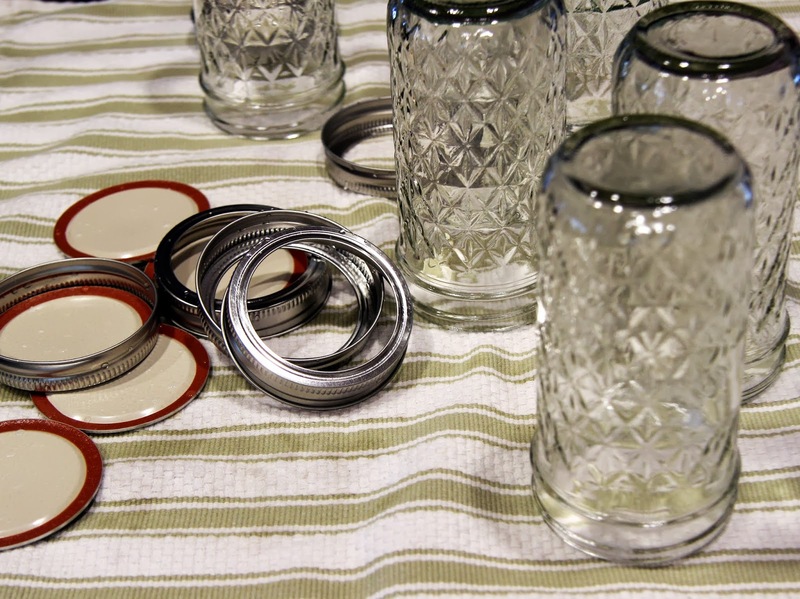 Place the lids on the jars, screwing the lids on lightly, not tightly. 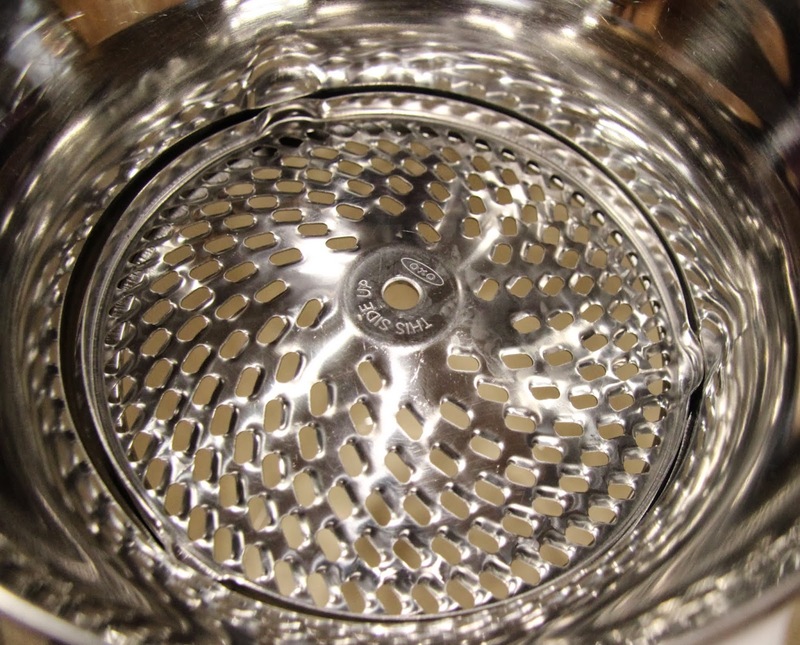 Place jars in the basket and lower it into boiling water, leaving at least an inch of water on top. Boil for at least 10 minutes, add 1-minute longer for every 1000 ft for elevations over 1000 ft. I boil mine for 15 minutes just to be on the safe side. 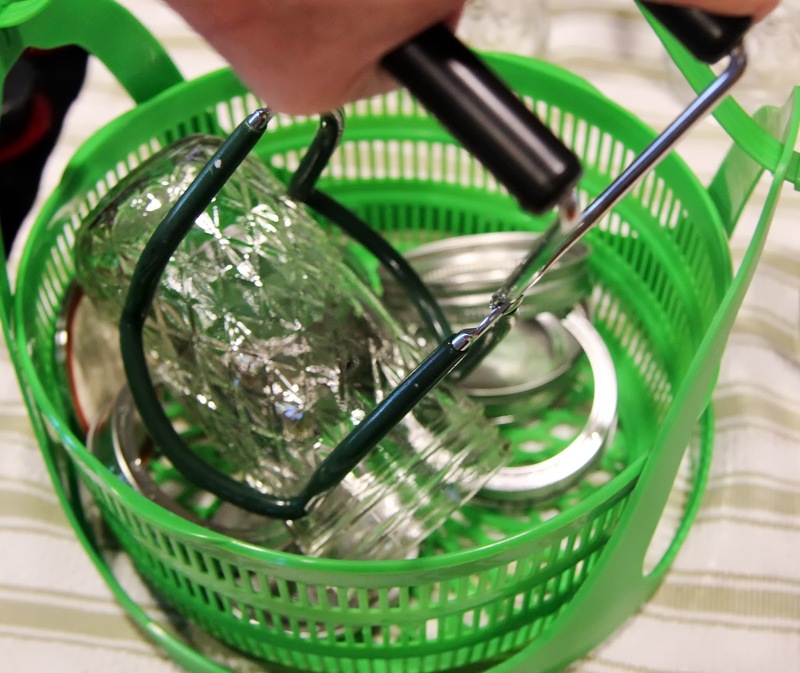 Carefully, remove the jars from the water by lifting the basket out of the water and using the jar tongs to set them on a clean, dry towel. Listen for the “pop” sound to tell you it has sealed. Sometimes it happens right away but it can take several minutes. 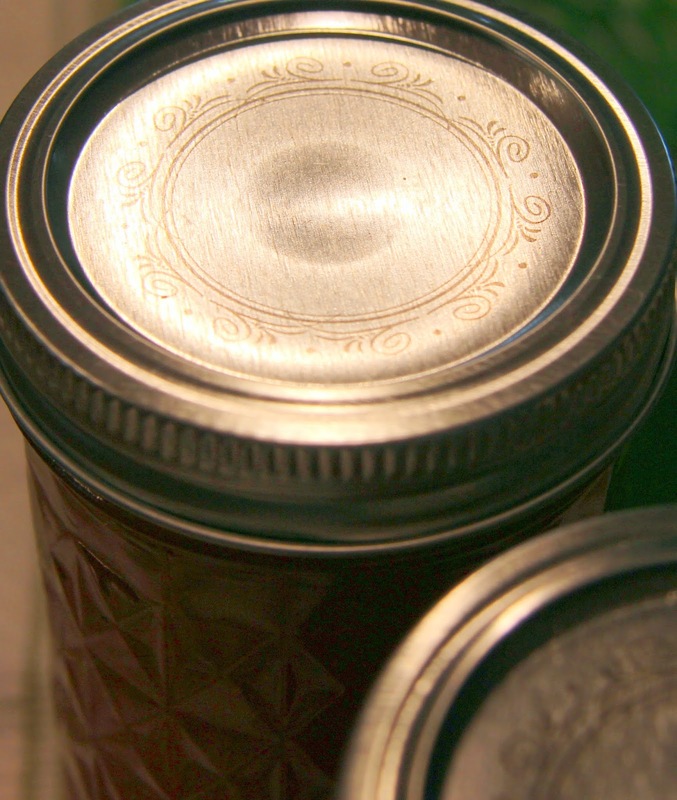 The middle of the jar should be indented when sealed. 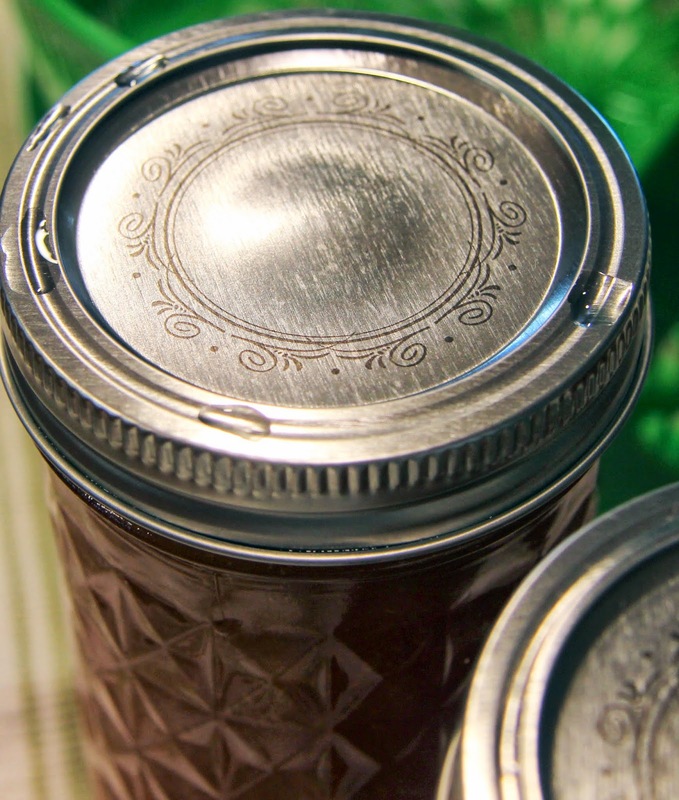 Allow the jars to cool overnight then store in a cupboard or pantry. Put a cute label on them before you give them away. Always refrigerate after opening. There! That wasn’t so hard, right? I swear I’m more exhausted after writing it all out than I was actually making the stuff! I’ve been in a crazy, scattered, confused, dark funk lately. It’s funny (and by funny I mean exasperating) how things you thought you’d worked through keep coming back to be dealt with when you least expect them. I am coming out of it though and am happy to report, all is well.